Brushes can be set to different sizes using the pre-set options or the slider. You can select different kinds of brushes (soft edge, hard edge) depending on your need. Mode: This dictates how the brush affects/interacts with the existing pixels. Opacity: the level of transparency of whatever you apply with the brush. Flow: Related to opacity. Dictates how quickly the color you are adding to the image reaches set opacity level. The Brush and Brush Presets Panel is activated by the toggle in the Options Bar or by going to Window–>Brush or Window–>Brush Presets. 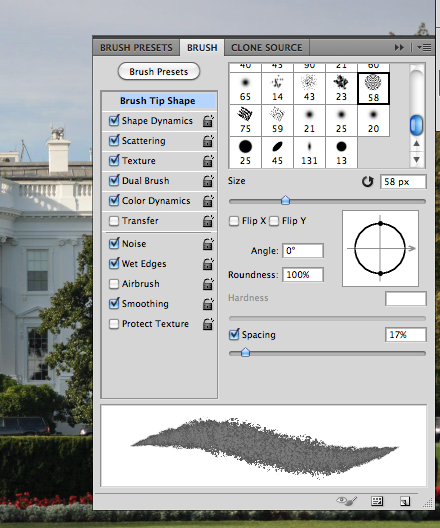 Download the Whitehouse image and explore the brush settings in Photoshop. First select the brush tool from the tool menu, and start experimenting. Remember to save copies and not to alter the original image. After you have experimented for 15 minutes or so, try to make the sky look more menacing by adding purple or red light to the sky. Make the grass look dried out and less green than it appears. 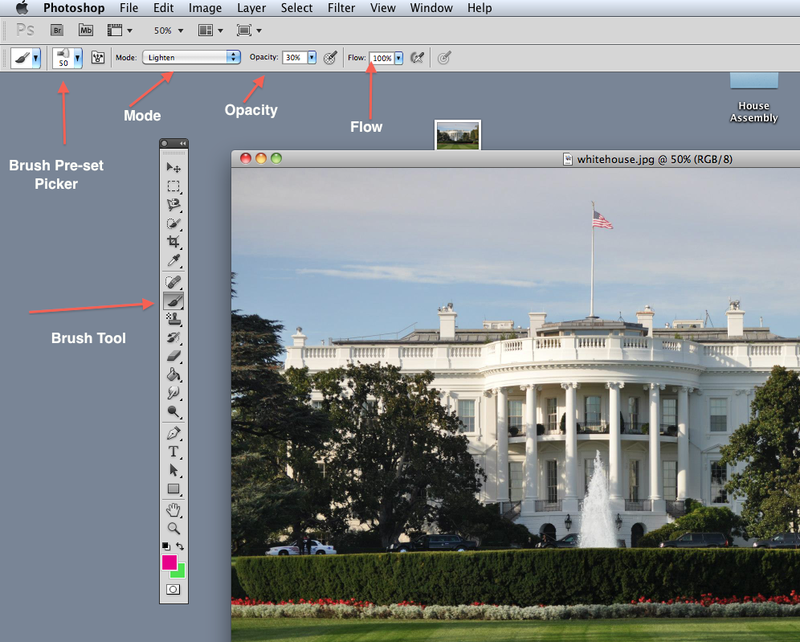 Retrieve 3 high resolution photos from the Flickr.com/creativecommons, and make changes to the images using the brush tools. Tags: Adobe Photoshop, Image editing. Bookmark the permalink.